Executives are talking about challenges to their business they didn't face just a few months ago. One of the biggest, they said, is the rising U.S. dollar. A widening gulf between the U.S. dollar and several foreign currencies is weighing on sentiment for U.S. companies trying to sell their goods overseas. Anheuser-Busch, 3M, Illinois Tool Works, UPS and PPG Industries have specifically cited currency as negatively impacting results and their outlook. The October stock market sell-off has been puzzling to many investors because most companies are riding high on business confidence and a tax-cut windfall. Plus, profit growth has been solid, and many companies have been beating expectations on strong sales numbers and a positive outlook. But one real worry cited on post-earnings conference calls is the rising U.S. dollar, which makes business overseas more expensive for U.S. companies. The strong dollar was cited by companies as varied as Anheuser-Busch and PPG Industries. And it's a problem that is only getting worse. 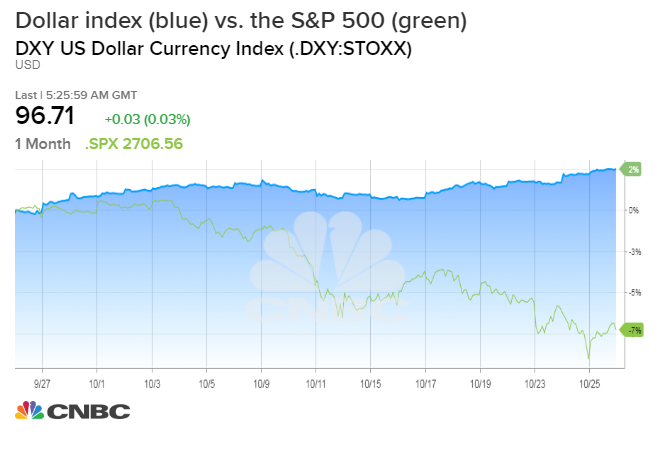 The gains in the U.S. Dollar Index, a measure of the greenback against a basket of major currencies, are accelerating, up another 2 percent in the last one month. By no coincidence, the S&P 500 has headed lower at the same time. 3M revised its earnings per share estimate to include a 5 cent per share hit from currency translation. It previously had factored in a gain of 10 cents a share. And United Parcel Service said currency fluctuations could be a drag of $35 million to $45 million in the fourth quarter. Add that to rising interest rates, rising fuel costs and the early effects of tariffs on imports of steel, aluminum and other manufacturing materials, and executives have struck a more cautious tone for the near term, though the overall message is still positive. The dollar was higher versus most currencies again on Friday morning as stock futures pointed to another big drop. "The market doesn't believe 2019 growth is going to be anywhere near what it is expected to be," said Nick Raich, CEO of research firm Earnings Scout. Raich adds that there's no evidence any of these fears will come true. Estimates for 2019 first- and second-quarter earnings have actually inched up, he said. And revenue growth of 8 percent for the S&P 500 companies that have reported so far is outpacing expense growth. Anheuser-Busch on Thursday slashed its dividend in half and said beer sales fell during the third quarter. Currency volatility is a challenge for the brewing giant, which bought U.K.-based SABMiller in 2016. "In the last six months, we've seen a lot of [currency] volatility," Chief Financial Officer Felipe Dutra told reporters on a conference call Thursday, as reported by Reuters. "This scenario triggers some sort of uncertainty and at a certain point ... we thought it was the right time to adjust the dividend." PPG, an industrial bellwether, said currency turned into a headwind the third quarter as the dollar strengthened. Currency translation lowered sales $80 million and pretax income took a hit of $15 million. It also said sales could be cut $50 million to $60 million in the fourth quarter because of the "unfavorable impact" of currency translation. Illinois Took Works said year-over-year earnings growth of 11 percent, to $1.90 per share, was on the high end of its range but included 3 cents a share of "unfavorable currency translation impact." Companies have had to adjust to account for the stronger dollar. "We've taken some other actions around the emerging markets and initiatives to ensure that we can overcome that," UPS CFO Richard Peretz said on a call with analysts. "That's one of the reasons we've called out the guidance for the total company to remain where we expect it to be even given this new headwind." Currency isn't the only extra cost companies are facing. On Thursday, Southwest Airlines reported record third-quarter profit that beat expectations, then burst the bubble by saying its costs were going up more than expected, largely because of fuel. American Airlines said a 42 percent increase in fuel costs ate into its third-quarter profit despite record revenue. More than one-third of companies reporting earnings so far have mentioned the Trump administration's tariffs. Harley Davidson said it will pay at least $40 million more this year to cover such costs. Estimates for next year reflect optimistic company guidance on sales and their ability to pass some of the higher costs on to customers, Morgan Stanley analysts said in a note last week. But tech is more vulnerable to profit-margin pressure, they said, as are consumer discretionary and transportation stocks. Texas Instruments, like other semiconductor companies, is also seeing weakness ahead. While it beat profit expectations, it issued a weaker fourth-quarter outlook blaming slower demand. "We are heading into a softer market," CFO Rafael Lizardi said on a conference call this week. "We believe this is mostly driven by a slowdown in semiconductors." That slowdown, executives said, comes after several years of strong growth.